What should students know, understand, and be able to do? What big ideas are worthy of understanding and implied in the established goals (e.g., content standards, curriculum objectives)? What “enduring” understandings are desired? What provocative questions are worth pursuing to guide student inquiry into these big ideas? What specific knowledge and skills are targeted in the goals and needed for effective performance? What relevant goals (course, program, learning, etc.) will this design address? What are the "big ideas?" What specific understandings about them are desired? What provocative questions will foster inquiry, understanding, and transfer of learning? What key knowledge and skills will students acquire as a result of this unit? What should they eventually be able to do as a result of such knowledge? Wiggins, Grant, and Jay McTighe. "Understanding by Design: Overview of UbD and The Design Template." Ed. ASCD. 2003. File last modified on Sept. 2005. PDF file. How will we know if students have achieved the desired results and met the content standards? How will we know that students really understand the identified big ideas? What will we accept as evidence of proficiency? Through what authentic performance task(s) will students demonstrate the desired understandings? By what criteria will "performances of understanding" be judged? Through what other evidence (e.g. quizzes, tests, observations, homework, etc.) will students demonstrate achievement of the desired results? How will students reflect upon and self-assess their learning? The backward design orientation suggests that we think about our design in terms of the collected assessment evidence needed to document and validate that the desired results of Stage 1 have been achieved. 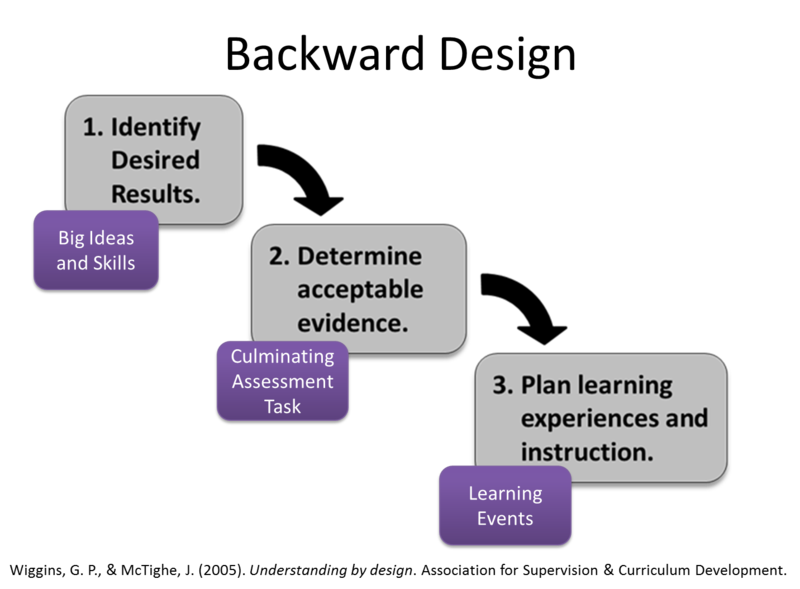 With identified results and appropriate evidence of understanding in mind, it is now time to finalize a plan for the learning activities. What will need to be taught and coached, and how should it best be taught, in light of the performance goals? What sequence of activity best suits the desired results? How will we make learning both engaging and effective, given the goals and needed evidence? know where the students are coming from (prior knowledge, interests)? H = hook all students and hold their interest? E = equip students, help them experience the key ideas, and explore the issues? R = provide opportunities to rethink and revise their understandings and work? E = allow students to evaluate their work and its implications? O = be organized to maximize initial and sustained engagement as well as effective learning? Next, download the following templates and then go to the discussion forum and response to the items posted.